I was born in Montreal but, like so many other ‘anglos’, now live in Toronto. I build and optimize WordPress websites for search engines. I also run half marathons and attend regular yoga and Pilates classes. My wife Bev and I like to hike and play golf. Life is good and I am a lucky man. I am an antitheist. For 25 years I managed the family business which evolved from a lumber wholesaler into a DIY home improvement distributor. The 70’s & 80’s were very good but we had to close the business in the 90’s because globalization and business technology made our services redundant. For seven years I owned and operated a computer training franchise, Productivity Point International, which I sold in 2002. Since 2002, in EmpowerYou.ca, I help entrepreneurs, small businesses, family businesses, professionals, not-for-profits, and individuals with Internet marketing and business technology. My experience in entrepreneurship, marketing, business management, business technology, and volunteering gives excellent value to my clients. 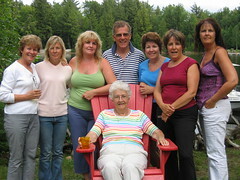 I was born in 1945 in Montreal, Canada and grew up with six sisters. My father and mother owned a lumber business so we had a comfortable life. I studied at the University of New Brunswick from 1963-67. 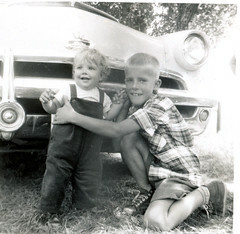 With my sister Barbara Foreman at Higgins Beach, Maine, summer 1953. 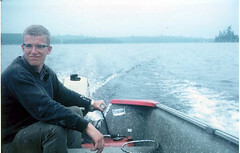 Fishing with my Dad in Quebec’s La Verendrye Park around 1962.